Teaching woodworking I often get a different perspective of a country than a tourist might. For me teaching is all about person-to-person connection, so while I’m sharing my love of woodworking, my students naturally share about their work, families, life, dreams. All of this helped me recently to understand better a part of the world I read about nearly every day but really knew little about. My wife Carolyn (who is an integral part of these adventures) and I were invited to Israel, to the small village of Yad HaShmona outside of Jerusalem. We were high on a hill as many of the villages seem to be, with long views towards dry forest and endless bands of limestone outcroppings, with many birds flying in and out of view. The shop we were working in was once the communal village workshop, making simple functional furniture for sale. Now it is rented by a young maker Gil, who both makes furniture and teaches classes there. He’s a magnet for lots of different woodworkers and kinds of woodworking. The shop was a rough metal sided building, high roofed and open along one long side to a sort of covered courtyard with piles of wood, small gardens, and worn chairs that always seemed to be occupied. The open side let in lots of natural light and any breeze. Inside the shop is more wood, many well-used benches, and walls covered with artifacts from past projects or projects underway, hand tools, metal and metalworking tools, a tiny kitchen corner. What was absent were machines. Even the grinder was hand cranked. There was a wonderful funkiness to it all that was very relaxed and welcoming — a hippie shop encouraging all sorts of creativity. I was invited by Gil and Mishael, an architect turned tool seller (tooleden.com) and very warm host to us, to run classes on using hand tools and decorative techniques, with a final half-day talk about my work and design. This is new and unusual to invite makers such as myself. 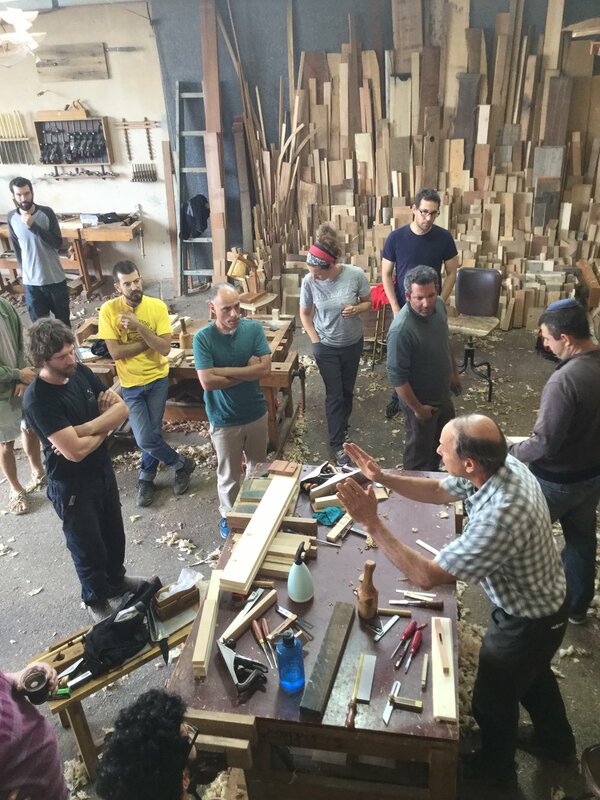 It’s all part of an effort to expand woodworking in Israel and bring it to a higher level. At least two other schools have sprung up recently, run by young makers who studied in the US. But there are plenty of hurdles for Israel’s woodworking. Wood is not their natural material, stone is, and nearly every part of every building is stone or concrete. I never saw any large trees unless they grew in protected parks, and almost all of these were pines, so almost all furniture quality wood is imported and expensive. The tools are expensive tool. From the number of old and worn Stanley #4s used, I suspect that most of my students had only modest incomes in an expensive country. There were also some LUBANs, a very good Chinese knockoff of Lie Nielsen that Mishael sells, and a few Lee Valley tools. This all makes me wonder if the biggest hurdle to Israel’s woodworking might not be finding a market for handmade furniture. Speaking of tools, one evening we were invited to a private tool museum of a carpenter/carver Gilboa, near Tel Aviv. 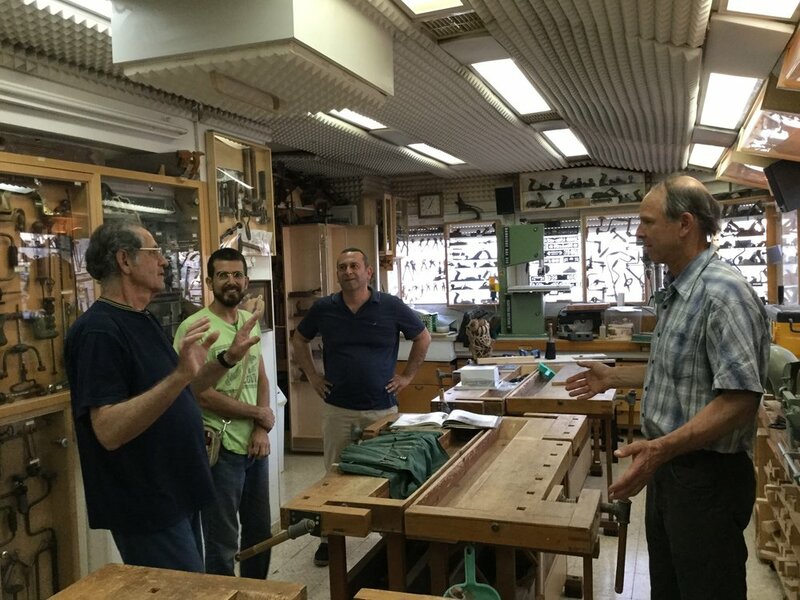 For years he has been buying Stanley’s and Sargents and all manner of rare and not so rare American woodworking tools, for his own enjoyment and to preserve them to be studied in Israel. It was a rich array of eclectic tools, what you would expect from chance Ebay purchases over many years. All the tools were displayed in sealed display cabinets on the inside of every window, labeled, and grouped with other like tools. There were even some old pedal power machines — a big grindstone you can still find here in Vermont, a jig saw, and unusual tablesaw. My classes were not much different from teaching in Europe, and working unplugged was not a big issue — everything just took longer. What was different were the unusual student names and/or pronunciation, which to their amusement I learned by writing in a little book I carry. Some were professionals working mainly in sheet goods, many more were amateurs.The energy and enthusiasm was high — woodworking seems to be that way — and the shop was always busy with visitors curious to meet me and see what was going on. Evidently the word spread throughout Israel. Maybe we will see some fun Hack inspired inlays or decorative details in future work by this group. One of the reasons we agreed to go to Israel was because we were curious about the land, the people, the architecture, culture, and to gain some insight into the politics. For thousands of years this land has been contested, overrun and won by different cultures — Arabs, Jews, Persians, Ottomans, Egyptians — right up to the present. The Old City within Jerusalem is divided into four parts, each claiming a piece of the deep religious history there. You would think that all of this cultural diversity would enhance their material culture, but we didn’t sense that it has. On the street you see Arabs, secular Jews, Ethiopian Coptic Christians dressed in all white, along with Orthodox Hasidic Jews dressed meticulously in black jackets, sometimes with big fur hats. And everywhere is military, mostly young, almost always toting machine guns. Jerusalem was truly an amazing mix. While we were there the Palestinians in Gaza were protesting and burning tires (which we could see one day from Jerusalem) and the US was opening its embassy, so politics were front and center. They spilled over into our conversations during the classes and afterwards. Everyone had opinions but no one had a solution, and there probably wont be one by the time we visit again. That’s their challenge. My challenge is bringing people together through what I know best — woodworking. 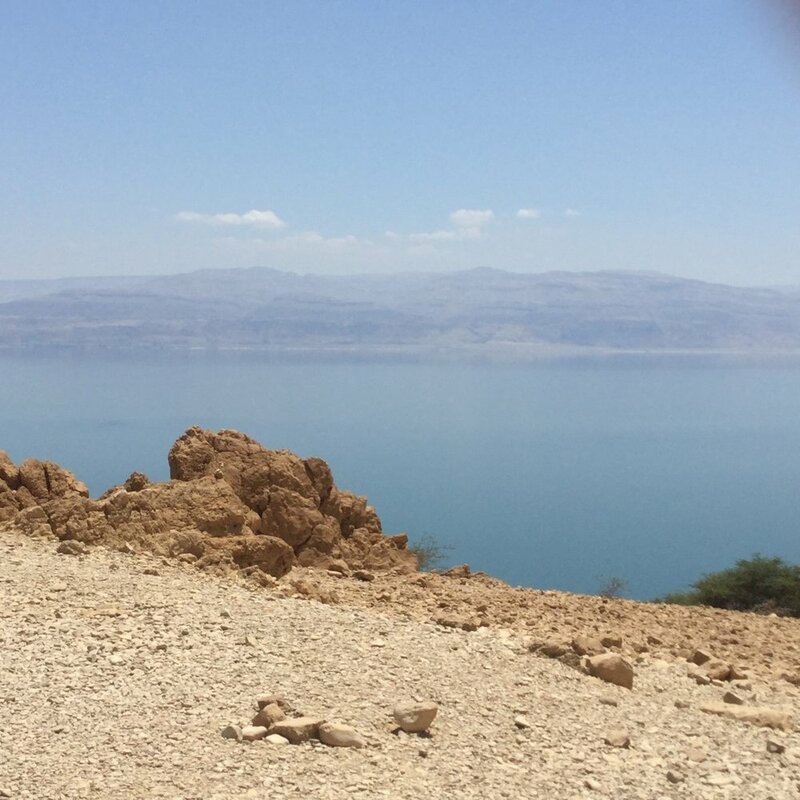 The Dead Sea, 400'+ below sea level, Jordan in the distance. Dunking in it was surreal. The Church of the Hole Sepulchre, one of the holiest of sites.